That is what Ray continues to tell himself throughout the story; and to be honest, he really isn’t. He is just a man with a rare “affliction” where the only medication is more amputees. Unfortunately, this “affliction” makes him more of a deviant than he believes himself to be. He shows up at support group meetings, hoping to seduce the menu and get his rocks off while, at the same time, potentially lifting up the spirits of these women. At least, that is until a new female employee, Kayla, starts working alongside him at Best Tronics and he falls for her HARD. Like, blue pill hard. From that point on, sh!t just gets weird. This was my first experience with Meyer’s writing and definitely won’t be my last. While Limbs falls in the horror genre, this is, simply put, a love story (like the title indicates). It is bawdy, bloody, and downright insane, but is told with a lot of hear and very few appendages. It is a very easy story to pick up and, while short, doesn’t leave you disappointed. Ladies?!?!? Meyer has a knack for creating characters, especially one with flaws (looking at you, Ray), but also characters that keep you guessing throughout the entire read. I literally (Chris Traeger voice) couldn’t tell whether or not our main character was going to continue living on the edge or dive deeper into his dark passenger. Gave me a Darkly Dreaming Dexter/Brady Hartsfield vibe the entire way through, which if I am being honest, was exactly the reason I enjoyed myself so much. 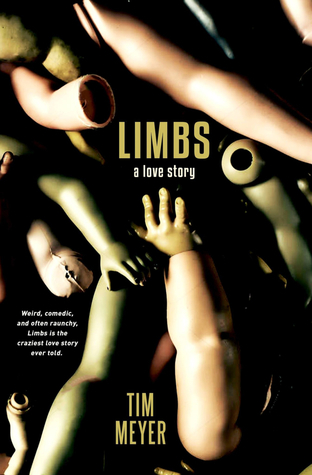 Limbs, in the same vein as Blister by Jeff Strand, ended up surprising me as I went into it expecting more blood and guts than could fill a bathtub. But don’t get me wrong, it isn’t for the weak of stomach or those without a leg to stand on. In all honesty, I couldn’t get enough.